Posted on April 12, 2019 at 2:46 pm. 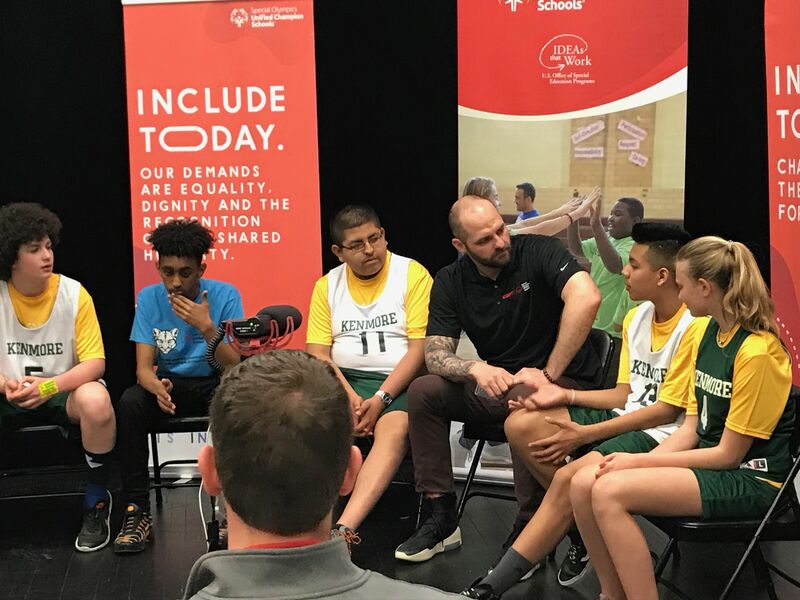 An Inclusion Revolution took place at Kenmore on April 12 with the presentation of a Special Olympics National Unified Champion banner by ESPN commentator Mike Golic, Jr. Last year, Kenmore was one of 30 schools named as a Unified Champion School. Five of these schools were selected to receive their banners via a special presentation by ESPN. In September, Kenmore was selected as one of these five schools. To be named a National Unified Champion School by the Special Olympics, a school must have an inclusive school climate. One that exhibits a sense of collaboration, engagement and respect for all. 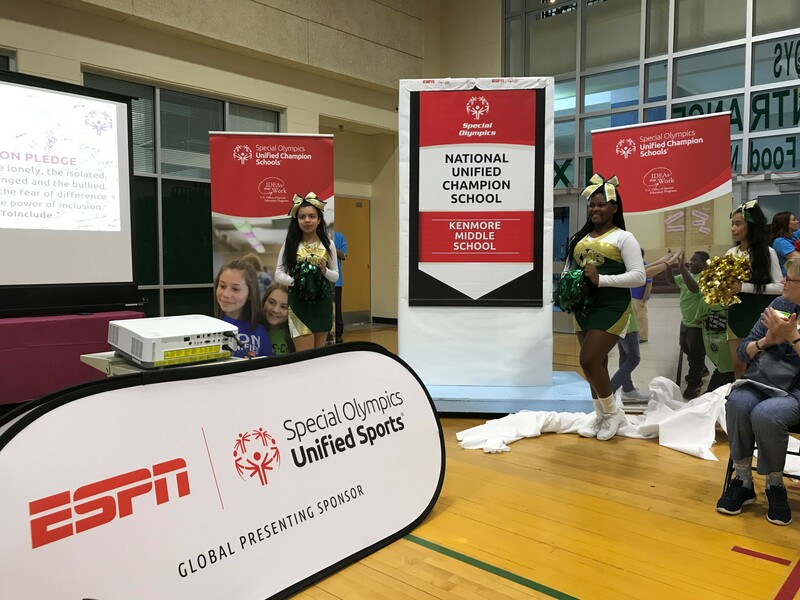 A Unified Champion School receiving national banner recognition is one that has demonstrated commitment to inclusion by meeting 10 national standards of excellence. These standards were developed by a national panel of leaders from Special Olympics and the education community. ESPN’s Mike Golic, Jr. talks with Kenmore students ahead of the banner presentation. “I believe in Inclusion in all aspects of life for our SuperKids. Special Olympics allows students the opportunity to participate in Unified sports with their typically developing peers. It gives them the chance to develop long lasting friendships, helps to build their self-esteem, and allows them to feel part of an inclusive school community,” said Eurith Bowen, Kenmore’s Life Skills teacher who has been the lead in cooperation with Michelle Hubert and Margaret Lindquist on the Special Olympics and Best Buddies programs at Kenmore. The primary activities within these standards include: Special Olympics Unified Sports® (where students with and without disabilities train and compete as teammates), Inclusive Youth Leadership and Whole-School Engagement. 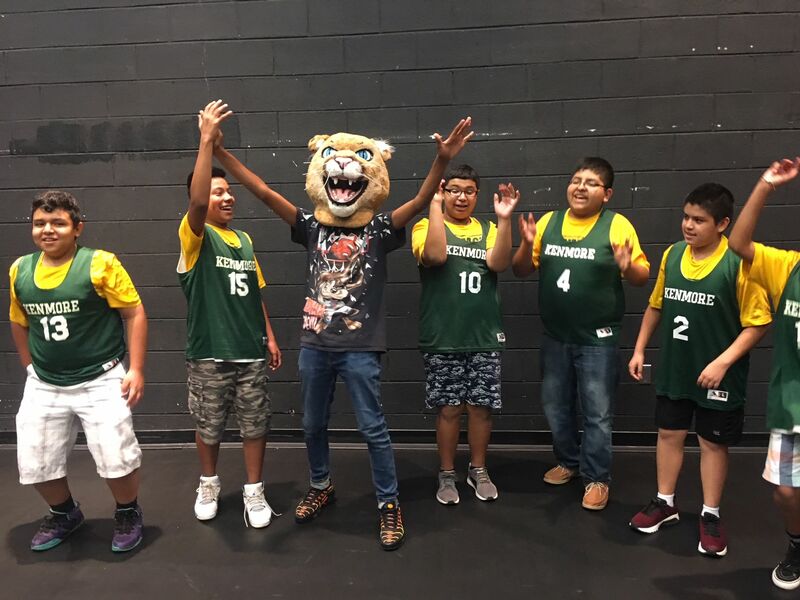 Banner Unified Champion Schools are also able to demonstrate they are self-sustainable and have a plan in place to sustain these activities into the future. Kenmore students showing their excitement before the ceremony. As part of the Inclusion Revolution held on Friday, everyone at Kenmore wore specially designed blue t-shirts celebrating the best buddies program and Unified Champion honor. In addition, Special Olympic athletes at the school were honored and celebrated with a special ceremony that included representatives from the Arlington County Police Department, several dignitaries from Special Olympics, Superintendent Dr. Pat Murphy, School Board Chair Reid Goldstein and Vice Chair Tannia Talento. 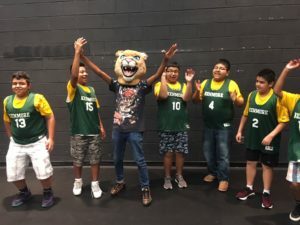 The program concluded with a pep rally and Unified Basketball game played with the entire school cheering on their classmates.